A travel pack that contains a 30 cm x 28 cm, double-sided board. One side has a full Go board, and the other has a beginner, 8 x 8 square board. 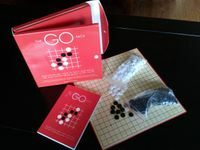 The pack also contains The Go Book.